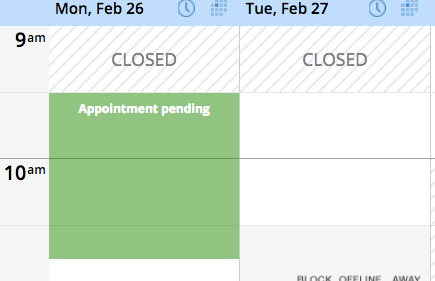 If you’re a business owner who’s always in your Genbook calendar, then you’ve probably noticed that a light green block containing the words “Appointment pending” shows up every once a while. When it does, you’re unable to click on or edit the time slot(s) it’s covering. This simply means one of your clients is in the process of making an online appointment, using the Book Now button or link you’ve posted on your site, Facebook, or elsewhere. That time slot is temporarily unavailable, to ensure you don’t end up unintentionally double-booked. 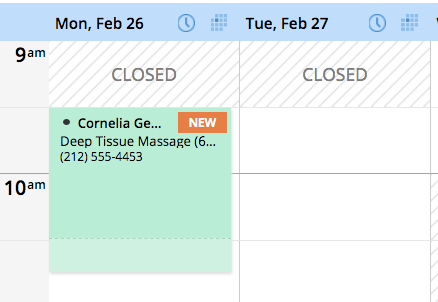 Once the client confirms the appointment, their details will appear on your calendar. If a client leaves the scheduling process before confirming the appointment, the time slot gets released (within about 10-15 minutes, to give them enough time in case they've just wandered away for a few minutes). If you see a pending appointment hanging around for more than 15 minutes, definitely reach out to our Customer Care team.